My initial thoughts hovered around what might have caused the medical leave and then hoping Jim will make a quick recovery. I then began to wonder if he was insured for disability insurance. With medical leave often comes medical expenses which have done nothing but increase in recent years. Without personal disability insurance, a medical leave will cause a serious financial strain on an individual or family. 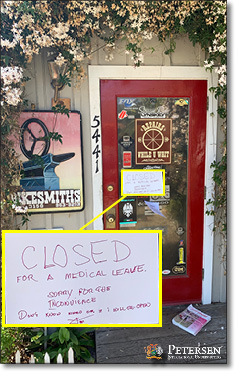 We can only speculate that Jim didn’t carry Key Person Disability Insurance, otherwise the one-man shop would be open for business and operated by another bike technician who could help run the shop during Jim’s medical leave. My final hope for Jim was that he has financial protection from both personal DI and Business Overhead Expense DI. With BOE, Jim should be able to keep the shop closed and focus on his recovery without the stress of making sure everything is running as it should. If the business owner didn’t carry Business Overhead Expense disability insurance, the bike shop quickly turns from an asset to a liability. The monthly expenses quickly pile up and put the business at serious risk of failure. It saddens me that events like this are typically the catalyst for people to consider disability insurance. We have all heard of people needing to take medical leave due to back injuries or even know people who have gotten cancer. Don’t allow your friends, family, or clients to continue to ignore the hazards of disability insurance. Start the DI discussion today and make sure the people you care about are properly covered.